Clifford Leroy Lough, age 86 of Darlington passed away on Tuesday, December 4, 2018 at St. Vincent Heart Center in Indianapolis. He was born in Shannondale, Indiana on May 5, 1932 to the late Orville & Minnie (Farrow) Lough. 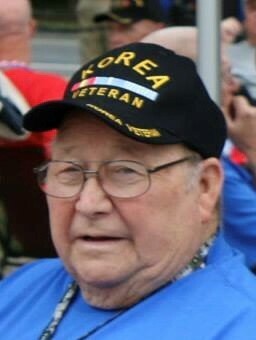 Cliff graduated from Darlington High School in 1951 and proudly served in the United States Army during the Korean War. On November 27, 1954 he married the love of his life, Sharon (Hankins) Lough, who survives. Cliff farmed in Montgomery County until retiring in 1991 and moved to Darlington. After moving to Darlington, he drove a school bus for North Montgomery School Corp. for 14 years. He enjoyed fishing, camping, visiting with others, and loved traveling. He was a member of the Darlington Congregational Christian Church, the Indiana Farmers Union – serving as president for three years of the Montgomery County Chapter, and was a member of the American Legion Post 302. He is survived by his wife of 64 years, Sharon Lough; two sons, Brian (Patty) Lough and Brad (Amy) Lough, all of Darlington; two daughters, Kim (Denny) Carpenter of Darlington and Kay (John) Barrett of Thorntown; a brother, Stan (Pat) Lough of Darlington; a sister, Audary Dixon of Ladoga; 12 grandchildren, Misty, Jennifer, Brandon, Ben, Luke, Elijah, Ashley, Ethan, Abby, Spencer, Logan, and Hayden; 16 great-grandchildren; and several nieces and nephews. He was preceded in death by his parents; an infant brother; two brothers, Max & Howard Lough; and three sisters, Martha Jean Moffitt, Barbara Denny, and Lucille Lyon.